Bruges has long been pulling in visitors with its cobbled streets, crooked bridges, meandering canals and World Heritage site medieval buildings – it’s so pretty that it’s almost too good to be true. But after the black comedy In Bruges showed a more edgy side of the city (complete with hit men, dwarves, shoot-outs and all), the city started to attract a whole new group of visitors. And quite rightly too, as Bruges’ charming streets, fantastic beers, boutique chocolate-makers and canalside bars are well worth a visit. 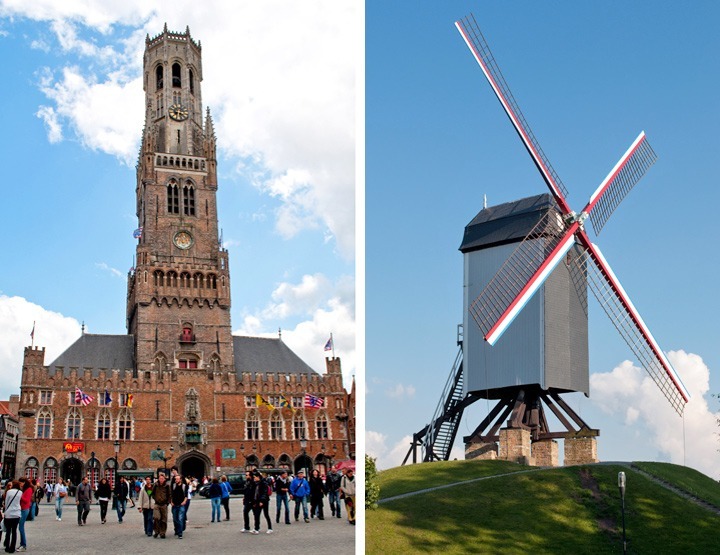 Plus being easy to get to – with rail travel from Brussels to Bruges included if you travel by Eurostar – and to explore on foot makes it a great weekend destination. At the heart of Bruges is the Grote Markt, or market square. 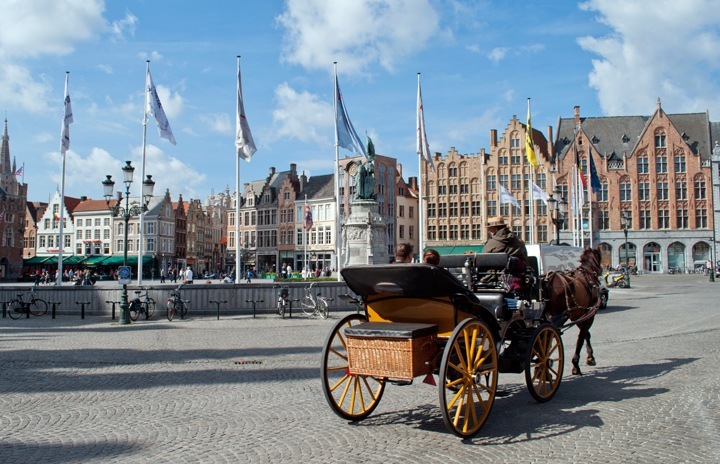 It’s a pedestrianised square – though watch out for the horse-drawn carriages – surrounded by cafés and restaurants, and towering above it is the Belfort belfry tower, where one of the In Bruges characters came to a messy end. You can follow in his footsteps (on the way up only hopefully) to the top of the 80-metre tower via 366 narrow, steep spiral stairs. It’s not advisable if you’re claustrophobic, but the views from the top are spectacular. Bruges is a popular place, so the area around the Belfry and Grote Market can get packed with tourists at busy times, but you can always escape the crowds by heading off down one of the cobbled side streets. There’s another quiet spot on the outskirts of the old town, where a series of windmills are scattered through parkland next to the city walls. Originally there were 25 windmills all the way around the city but there are only four left now. To find them you just follow the river in the north of the city. 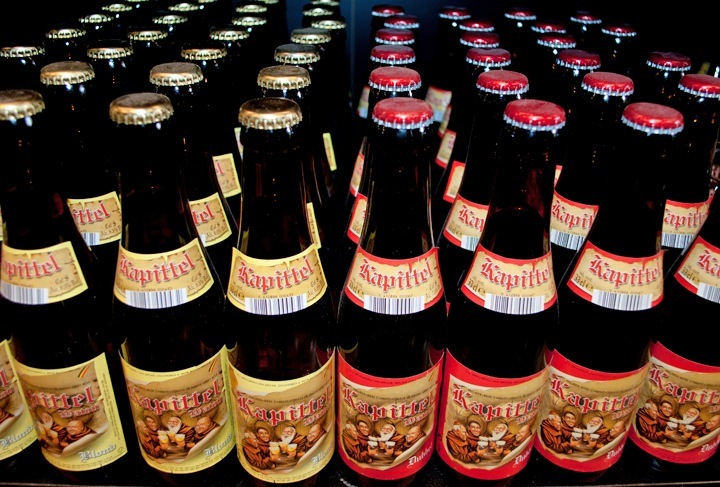 Belgium’s two most famous exports have got to be chocolate and beer, and there are plenty of opportunities to try them both in Bruges. There are chocolate shops on every corner, and even a museum dedicated to the stuff. But if you fancy trying something more unusual than the normal fruit and nut varieties, then The Chocolate Line shop does amazing – and sometimes bizarre – handmade chocolates. You can try flavour combinations like the Provence (with lavender), Atlanta (Coca Cola), Bangkok (coconut and lemongrass) and even the Bollywood (saffron and curry) if you’re feeling brave. Bruges is full of places to drink beer, but there’s only one place in the old town where it’s still being made – De Halve Maan (aka The Half Moon). The brewery runs 45-minute tours for €6, going through how they make their beers and ending up with a tasting of one of their four beers. The tour takes you along narrow passageways and up ladders onto the brewery’s roof for a panoramic view across the city. 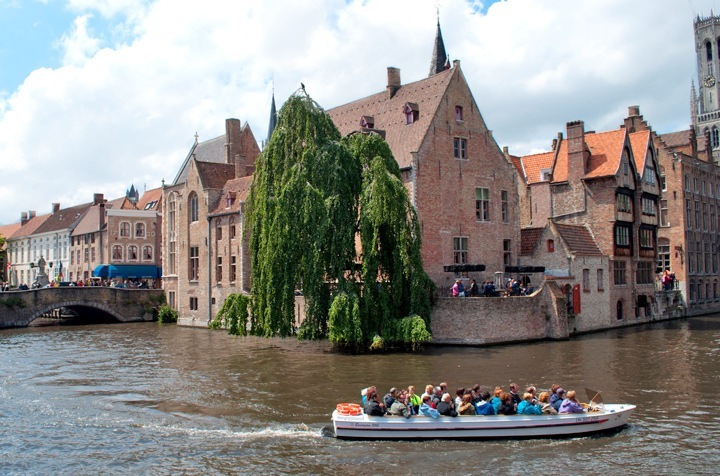 With more canals than roads in the old town, one of the best ways to see Bruges is on a boat trip. Trips around the canals last about half an hour and run from various points in the centre. If the queues near the Grote Markt are too long, then try one of the quieter spots a bit further out. Or if you want to get out and explore a bit further afield, you can take a boat trip out to the town of Damme. Boats leave from just beyond Bruges’ city walls and follow a long, straight canal – originally built so that Damme could be used as a port for Bruges – the four miles to Damme. The town has a good book market and a pretty central square surrounded by restaurants. Try a hot chocolate and a pancake oozing with Nutella from the crêpe stall – and if you want to work it off you can walk back along the canalside path to Bruges. Getting there… The nearest airport is in Brussels, with flights from across the UK (including London, Manchester, Liverpool, Birmingham, Bristol and Edinburgh) and around the world. From there it’s a 45-minute train journey to Bruges. 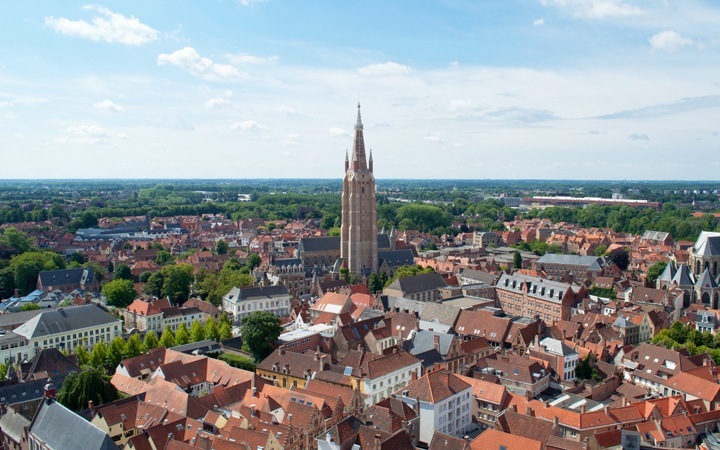 Or you can take the Eurostar to Brussels (1 hour 50 mins) then change trains onwards to Bruges – if you make sure your Eurostar ticket is to ‘any Belgian station’ then travel on to Bruges is included in your ticket price. 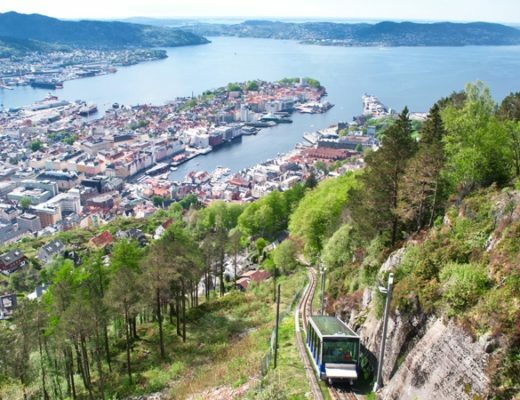 The city is compact and easy to get around by foot. Sleeping… B&B Bariseele (connected to the next-door Hotel Fevery) is set in a quiet street a 10-minute walk along the canals from the Grote Markt. Friendly owner Benny knows all there is to know about Bruges, and the three rooms range from €60–140 and come with a big continental breakfast, served in your room at weekends. Our top-floor ‘Room with a View’ had a huge bathroom, kitchenette area with fridge and microwave, and a view across to St Giles’ Church. Or right alongside the canals, the family-run Hotel Prinsenhof is a boutique hotel with lots of luxurious touches. Rooms range from €176 to €367 and come with four-poster beds, spa baths and a free two-hour guided city tour. Eating and drinking… You can’t come to Bruges without tasting a few beers, and one place with enough varieties to keep you going for weeks is 2be. This shop sells beers from all across Belgium, displayed in a huge ‘wall of beer’ along the side of the building, and has a terrace overlooking the canals where you can watch the tour boats sail by. Another good spot for a drink in the sun is Punta Est, with tables lining the canalside tucked away down a side street. They also do food and have a good wine list if you want a change from all that beer. Restaurants in Bruges can be pricey, so if you want to save money look out for good deals on set menus at lunchtime that are half the price they are in the evenings. If you want to try some local dishes, the restaurant at the De Halve Maan brewery uses their beer in dishes like carbonnades flamandes, a beef and beer stew, or lapin á la gueuze, rabbit cooked in beer. Been wanting to visit Bruges for a while and now I’m even more eager to go! It is lovely – one of those places designed for aimless wandering with a lot of beer/chocolate stops en route! Brilliant film. It made me think Bruges looks even better in the winter. Belgium is one of my fave countries – can’t understand why it has a reputation for being dull. I saw some photos of it in the snow and it looked beautiful, so might have to do a winter visit too. I’ve been there in freezing fog. Believe me you don’t want to do it! Wouldn’t mind to go back in a bit of sunshine though. Was thinking more pretty snowflakes than freezing fog but you might have put me off a bit there, the May sunshine was much nicer! I spent a nice day there in Summer 2009 – thanks for reminding me! Its such a pretty place and well worth a couple of days exploring, hope you manage to make it out there sometime soon. My favourite Bruges pub is t’Brugs Beerje, where they have hundreds of beers each with their own glass. I don’t think we spotted that one – one for the next visit then! 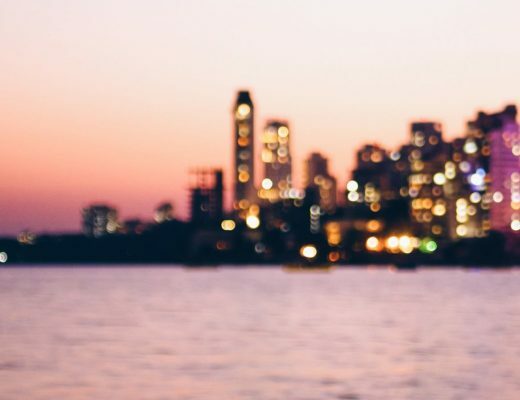 Germany is missing in the list 🙂 Come visit the beautiful and diverse German Baltic Coast full of creativity, culture, architecture, and landscape. It’s worth a trip! 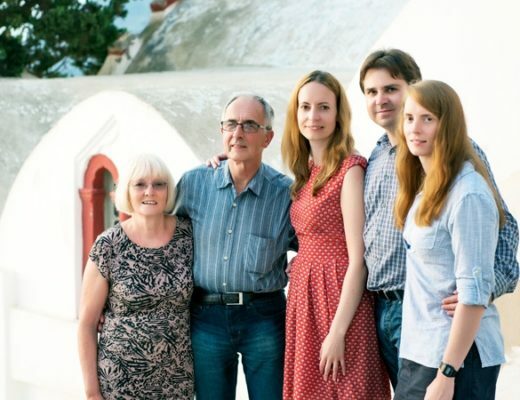 It’s such a great place – I went for a weekend with my mum too and we really enjoyed it, will definitely be back again. Bruges is the only city where we were pickpocketed. We have traveled to over 75 countries. The message is not matter how friendly the place be much more aware than we were. Sorry to hear you had a bad experience in Bruges – pickpockets can be so sneaky, I’m lucky to only have ever been a victim once (in Paris) but something to watch out for wherever you are. Bruges is very nice. But I personally find that it has become a bit too touristic. My favourite city in Belgium is Gent. Bruges is definitely touristy, but still beautiful though! I haven’t visited Ghent yet but would like to explore more of Belgium sometime. Bruges is indeed touristy but has some great hidden gems. It’s still an awesome city to visit..
I’ve not been to Ghent yet but it looks well worth a visit!